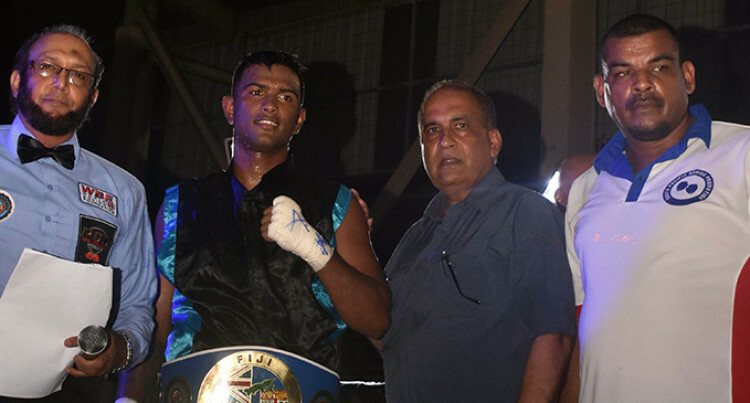 Abhay Chand has challenged new­ly crowned Fijian middle­weight champion Sebastian ‘The Sniper’ Singh. Chand said he’s ready for the big fight. Singh won after Rakuro Daunivavana retired in the third round claiming that he had in­jured his wrist to the disappoint­ment of the fans at Tilak High School hall on Saturday night. “I made sure Rakuro throw punch­es in the air as it tires him out,” Singh said. “Usually people are more cultured to see me going out and having a brawl with my opponents. “This time the game plan was to box him from the outside, stick to the jab and throw some big shots. “I was looking forward to a brawl, I was looking forward to a good fight a toe-to-toe fight knowing Rakuro is a tough customer. Singh said the fight against Chand would happen soon. “The promoters have to agree to our terms. “No matter what anyone says peo­ple know it’s a big fight and Ahbay is not a walk in a park. “Abhay is a tough customer and is known for his deadly right hand.